This insurance covers you up to $500,000 in the event of an accidental bodily injury resulting in one of the losses listed below, while travelling on a common carrier, or while at the airport, pier, terminal or station at the beginning/end of your trip. Coverage is activated when you have paid for the full transportation fare for your trip with your RBC credit card and/or WestJet dollars prior to commencing your trip. Note: Benefits are payable only when a covered person suffers an injury that results in any of the above losses within 365 days of the date of the accident. In addition to the amount payable above as the result of a loss, you will also be reimbursed for the reasonable and necessary expenses you actually incurred, up to a limit of $2,500, for special training provided these expenses are incurred within 2 years from the date of the accident. Also, when you are confined as an inpatient in a hospital for injuries that result in a payable loss, and you require the personal attendance of a family member as recommended by the attending physician, the insurer will pay, up to a maximum of $1,000, for the expenses incurred by the family member for transportation to you by a common carrier. If, as a result of an accident, you sustain injuries resulting in multiple losses, the maximum benefit payable by the insurer to you for all your losses will equal the highest benefit amount for 1 of your losses and will not exceed $500,000. Benefits will not be paid while you are in a coma. Call Assured Assistance at 1-800-533-2778 at the time of the loss to receive the necessary claims assistance. Otherwise, call the RBC Insurance Claims Center at 1-800-464-3211 within 30 days of the date of the loss to obtain the necessary claim documents. You must submit the information required for your claim within 90 days of the date of the emergency treatment or other expenses were first incurred. If this is not reasonably possible, you must do so within 1 year or your claim will not be reviewed. If your rental vehicle is damaged or stolen while rented out in your name, you are covered up to the vehicle’s actual cash value plus any valid loss of use charges, reasonable towing charges and administrative charges resulting from the damage or theft. This includes damage resulting from malicious vandalism and theft. Note: This insurance does not cover third party liability coverage. Check with your personal automobile insurer and the rental agency to ensure that you and all other drivers have adequate third party liability, personal injury and damage to property coverage. If the vehicle has sustained damage of any kind, call Assured Assistance at 1-800-533-2778 immediately, but in all events within 48 hours. Personal property and gifts purchased using your WestJet RBC World Elite MasterCard and/or WestJet dollars are insured against all risks of direct accidental physical loss or damage for 90 days from the date of purchase. If you paid for the personal property or gift using your WestJet dollars, you are insured for the amount of WestJet dollars you redeemed to pay for your purchase. 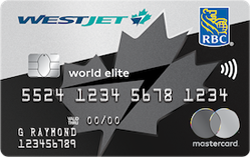 Note: The maximum amount of coverage is $50,000 (or the equivalent number of WestJet dollars) per WestJet RBC World Elite MasterCard account for each year. If you call Assured Assistance at 1-800-533-2778 at the time of the loss or damage you will receive the necessary claims assistance. If you do not call Assured Assistance, you must notify the RBC Insurance Claims Centre at 1-800-464-3211 within 30 days of the date of the loss or damage. This insurance plan automatically doubles the original manufacturer’s warranty, up to a maximum extension of one year. Coverage starts immediately following the expiry of the original manufacturer’s warranty, but in no event will the combined Extended Warranty and original manufacturer’s warranty exceed five years. Items covered by Extended Warranty Insurance must have been purchased using your WestJet RBC World Elite MasterCard and/or WestJet dollars. Note: You must notify the insurer to obtain approval of the repair services and the repair facility before proceeding with any repair services. If, as a result of one of the covered reasons for interruption occurring during your trip, you are prevented from continuing the trip or are unable to return to your departure point on the original scheduled return date, your eligible expenses are covered up to $5,000 per person and up to $25,000 per trip. You, your spouse and dependent children, as well as up to 3 travelling companion are all eligible to receive benefits under this insurance when the full cost of the trip is paid for with your WestJet RBC World Elite MasterCard and/or WestJet dollars. In the case of interruption of your trip, you will be reimbursed for the non-refundable unused portion of your prepaid travel arrangements, excluding the cost of prepaid unused transportation back to your departure point. You will also be covered for your economy-class transportation via the most cost-effective route to your departure point, or to your next destination (inbound and outbound). Note: Travel benefits must be undertaken within 10 days following your originally scheduled return date if your delay is not the result of hospitalization, or within 30 days if it is. Call Assured Assistance at 1-800-533-2778 immediately to receive the necessary claims assistance. If you do not call Assured Assistance, you must notify the RBC Insurance Claims Center at 1-800-464-3211 within 30 days of the date of the cause of interruption or delay to obtain a claim form. If your scheduled flight departure is delayed by more than 4 hours, then you will be reimbursed up to $250 per day per person and up to a maximum of $500 per occurrence for the reasonable and necessary expenses you incur. In addition, if you miss a connecting flight due to the delay of your incoming flight, or you are denied boarding your confirmed scheduled flight due to the airline's overbooking, and in either of these cases alternative transportation is not made available to you within 4 hours, you will also be reimbursed. Reasonable and necessary expenses include hotel accommodation, restaurant meals, refreshments, emergency purchases and other sundry items (such as a magazine, paperback book and other such small items). This insurance is effective when the full cost of your airline ticket is paid with your WestJet RBC World Elite MasterCard and/or WestJet dollars, and your luggage is checked with that airline. Note: Reasonable and necessary expenses must be incurred within 48 hours of the delay or denied boarding. If you call Assured Assistance at 1-800-533-2778 at the time of the flight delay, missed connection, or denied boarding, you will receive the necessary claims assistance. If you do not call Assured Assistance, you must notify the RBC Insurance Claims Centre at 1-800-464-3211 within 30 days. This insurance covers reasonable and customary expenses, in excess of any medical expenses payable by your GHIP or any other insurance plan, for emergency treatment medically required during your trip as a result of a medical emergency. Unless otherwise noted, the maximum benefit for emergency medical insurance is unlimited. Call Assured Assistance at 1-800-533-2778 before you receive emergency services, or as soon as medically possible to receieve the necessary claims assistance. If you don't call Assured Assistance before you seek emergency treatment, or if you choose to seek care from a non-approved medical service provider, you will be responsible for 20% of your medical expenses covered under this insurance (and not recovered from your GHIP), to a maximum of $25,000. Should your medical condition prevent you from calling Assured Assistance before seeking emergency treatment, you must call as soon as medically possible or someone else may call on your behalf. You must submit the information required for your claim within 90 days of the date of the emergency treatment or other expenses were first incurred. If this is not reasonably possible, you must do so within 1 year or your claim will not be reviewed. In the event that your checked luggage is permanently lost, you will be reimbursed up to $500 per person and up to a maximum of $2,500 per trip for the reasonable and necessary expenses you incur for the minimum essential clothing and toiletries. If you call Assured Assistance at 1-800-533-2778 at the time of the loss you will receive the necessary claims assistance. If you do not call Assured Assistance, you must notify the RBC Insurance Claims Centre at 1-800-464-3211 within 30 days of the date of the loss. If your checked luggage is delayed by more than 4 hours from the time of your arrival at the scheduled destination, you will be reimbursed up to $500 per person and up to a maximum of $2,500 per trip for the reasonable and necessary expenses you incur for the minimum essential clothing and toiletries. Emergency purchases must be made before your checked luggage is returned to you and no later than 4 days after you've arrived at the scheduled destination. If you call Assured Assistance at 1-800-533-2778 at the time of the delay you will receive the necessary claims assistance. If you do not call Assured Assistance, you must notify the RBC Insurance Claims Centre at 1-800-464-3211 within 30 days of the date of the delay. If your personal property is lost or damaged as a result of wrongful entry, indicated by visible signs of force, into your hotel room, motel room, or cruise cabin while you are a registered guest, you will be reimbursed up to a maximum of $2,500 per burglary occurrence for the repair or replacement of your personal property. Coverage begins at the actual time you check into your hotel room, motel room, or cruise cabin, provided that your hotel room, motel room, or cruise cabin is paid with your WestJet RBC World Elite MasterCard card and/or WestJet dollars. If you call Assured Assistance at 1-800-533-2778 at the time of the burglary you will receive the necessary claims assistance. If you do not call Assured Assistance, you must notify the RBC Insurance Claims Centre at 1-800-464-3211 within 30 days of the date of the burglary.